In the 80’s, Heart were huge. As soon as they released something new they had big sales and hit songs that were all over both radio and MTV (Yes, MTV actually played music once upon a time…). That was the Heart that I grew up with. Even if I knew OF them before, I haven’t actually heard a single note from then until I heard “If Looks Could Kill” from their self titled come back album from 1985. I loved them back then and I still love those albums today even though Ron Nevison did his best to destroy their sound, as he always does. Sure, they had a plastic and sterile sound, just as many other bands in the 80’s, but their songs were all killers. But in came the 90’s and grunge and swept Heart’s radio friendly AOR-ish hard rock off the map and all of a sudden, Heart were history. It didn’t matter that hip bands like Alice In Chains and Soundgarden praised them. Their last album, Desire Walks On came out in 1994 and it totally bombed. Too bad as it is a great album, a little darker, but still sounds like Heart. Still, that was enough for the Wilson sisters to disband the group and concentrate on other things – things like the trivial Lovemongers. 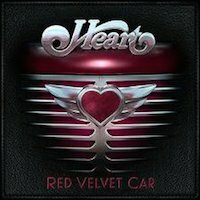 But in 2006 sisters Ann and Nancy Wilson decided to give Heart a go again. With a new line up (which at times consisted of both Gilby Clarke (Guns N Roses )and Mike Inez (Alice In Chains, Ozzy Osbourne)) and the criminally underrated album Jupiter’s Darling, Heart tried to win back the fans and repeat past glories. Even though they pulled a big crowd for their gigs, the record sales were absent. Probably much to do with the fact that the album had little to do with the sound they had in the 80’s and no matter what you think of those albums, it was their most successful era ever. Their fans who discovered them in the mid 80’s, like me, had little knowledge of the band’s more folkish style from the 70’s and to many of those fans, Jupiter’s Darling didn’t sound like Heart at all. But no matter how much I like that album, I can certainly understand that – and agree as well. But the sisters apparently refuses to give in, because now they are back with a new CD. But unfortunately, this one doesn’t hit home at all. In many ways it resembles its predecessor in style, but instead of having a bunch of interesting songs, they have based the songs on mellowness and acoustics and I don’t think it’s the right way to go. Especially when the songs aren’t that memorable. Fact is, when you have finished playing the record, you don’t remember one single note of it. ”There You Go”, the opening track is pretty good, although much too mellow. The two ballads I really like here are the catchy ”Hey You” and the fantastic ”Sand” that closes the album perfectly, but it is ”WTF”, a real rocker and ”Death Valley”, a heavy and dark tune that really gets me going. If they wrote more of that stuff the girls could have a real killer on their hands. Instead, most of the tunes are in the vein of the laid back and almost sleepy title track, which is a shame. Two rockers and two great ballads can’t save this album, I’m afraid and to be honest, I would prefer that they had an 80’s resurrection and went back to that style. Sure, they hardly wrote any songs themselves back then, but on the other hand, they songs were great and Heart were a fun band, which is hardly the case these days. Unless you see them live. I saw them play at Sweden Rock Festival back in 2004 and the concert was all but boring. In many ways, I get the feeling that the Wilson sisters are ashamed of their 80’s past, which is such a shame when you consider the fact that the majority of their fans seems to have that period of time as their favourite. I keep my fingers crossed for a killer record next time around. Ahh well. Can’t win em all? Too bad. I would have loved to love this. I didn’t like their newest album Fanatic either. I’m a huge fan of Ann Wilson’s voice though.